In the new knowledge economy, traditional modes of thinking are no longer effective. Compartmentalizing problems and solutions and assuming everything can be solved with the right formula can no longer keep pace with the radical changes occurring daily in the modern business world. It's Not Complicated offers a paradigm shift for business professionals looking for simplified solutions to complex problems. In his straightforward and highly engaging style, Rick Nason introduces the principles of "complexity thinking" which empower managers to understand, correlate, and explain a diverse range of business phenomena. For example, why some new products go viral while others remain unnoticed, how office cliques develop despite collaborative work policies and spaces, how economic bubbles form, and how an unknown retiree foiled one of the most carefully planned product launches ever with a single letter to the editor of his local newspaper. 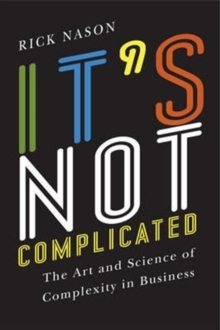 Rather than consider complicated and complex as interchangeable terms, Rick Nason explains what complexity is, how it arises, and the errors in solving complex situations with complicated thinking. It's Not Complicated provides managers with fresh, counterintuitive, and actionable models for dealing with challenging business problems.